KIEV, Ukraine -- Mikhail Zabrodsky, the broad-shouldered commander of Ukraine’s airborne troops, came of age in the Soviet Union. After the Soviet collapse he even served in the Russian army. When he moved home to Ukraine he stayed in touch. “We were all friends,” he says, shaking his head. Ties between the two countries, forged over more than a millennium, are deep. Russia and Ukraine both trace their lineage to a Slavic prince, St Vladimir (or Volodymyr), who appears on both countries’ banknotes. For centuries, tsarist Russia claimed Ukraine as an extension, calling the territory “Little Russia”. Under the Soviet Union, the narrative shifted to one of brotherhood, with the Communists presenting Russia and Ukraine as parts of an inseparable Slavic family. When Khrushchev as Soviet leader gave Crimea to Ukraine in 1954, he was marking the 300th anniversary of the Pereyeslav Rada, a compact joining Cossack-ruled territory in Ukraine to the Russian empire. In 1982 a silver titanium “Arch of Friendship” in honour of “the reunification of Ukraine and Russia” was erected on a hilltop outside Kiev overlooking the Dnieper river. Even after Ukraine voted for independence in 1991, bilateral relations remained mostly cordial. But by annexing Crimea and waging war in Ukraine’s south-east, Russia’s Vladimir Putin has made an enemy of erstwhile brothers. In the past 18 months, a psychological shift has seen public opinion in Ukraine turn sharply against Russia. In September 2013, just before the Maidan revolution, 88% of Ukrainians felt “positively” about Russia, says the Kiev International Institute of Sociology. By May 2015, that number had fallen to 30% (it would be a lot lower if it excluded people in the rebel-held south-east). That will hamper the Kremlin’s efforts to pull Ukraine back into Russia’s orbit, which it managed after the 2004 Orange revolution. Putin still speaks of Russians and Ukrainians as “one people”, but Ukrainians don’t see it that way. The changing mood manifests itself on Ukraine’s streets. There is a movement to boycott Russian goods: markers noting “Russian products” dot Ukrainian supermarket shelves. A sign in Kiev’s Museum of Mikhail Bulgakov (a Kiev-born writer who wrote in Russian) tells visitors who “support the military occupation of Ukraine” that they are not welcome. Not far from the Friendship Arch, vendors who once sold Soviet kitsch now tout patriotic Ukrainian wares and anti-Russian souvenirs. “The selection has changed with the people’s tastes,” says Artyom Shumilov, who sells varieties of toilet paper plastered with Putin’s face at his stall in Kiev’s Andreevsky Descent. The longer the war drags on, the more entrenched opinion becomes. Olexander Scherba, a Ukrainian diplomat, eschewed the Maidan protests, calling himself “a Eurosceptic and Russophile” on his Facebook page in late 2013. “I was ready to forgive Russia a lot,” says Mr Scherba, now Ukraine’s ambassador to Austria. Even many who made allowances over Crimea have begun to see Russia differently. And in the last three months of 2014, the share of eastern Ukrainians who viewed Russia positively fell from 83% to 51%. Polling by the International Republican Institute finds a majority of Ukrainians in government-controlled territory favouring membership of the European Union, whereas only 13% want to join Russia’s customs union. Ukraine’s government has begun building a wall along its border with Russia, a symbolic gesture attuned to the country’s mood. Support for Ukrainian independence has never been higher. “Putin has done more to unite Ukraine than anyone else,” says an official in Ukraine’s presidential administration. Yet some fret that this may not last. Petro Poroshenko, Ukraine’s president, warns against a “revanche of pro-Moscow political forces” in forthcoming local elections. Regional divides are deep: despite the war, many in the south-east are sympathetic to Russia. Practical economic concerns make cutting ties with Russia impossible. 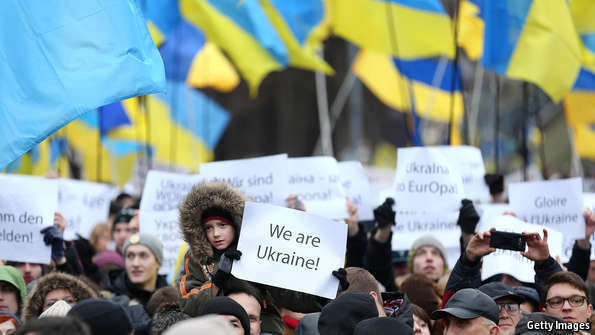 A failure to deliver on the promises of the Maidan could leave Ukrainians disenchanted. But though patience with Ukraine’s new leaders may wear thin, a return to Russia’s embrace is unlikely. “We were stabbed in the back by our own people,” says Vladimir Paniotto, director of the Kiev International Institute of Sociology. At times it take a 2 by 4 for people to come to their senses. Ukrainians should have known - at various times in their "fraternal" association with Russia - that Russia is not a friend of, nor even the "same people" (as Putin likes to say it) as, Ukrainians. They should have learned from the very first time when Prince Dovhoruky destroyed Kyiv in the early 12th century that Russia was an alien force. Then, after Khmelnitsky signed the accursed Pereyaslav Treaty with the Muscovy Czar in the 17th century to jointly defend Orthodoxy from Catholic Poland and the Turks, they should have learned what Russia was after it betrayed Ukraine and divided the land with Poland. Then, when Czarina Catherine destroyed the Cossack host and state and built St. Petersburg upon the bones of tens of thousands of Cossacks, they should have known. Then, when Ukraine groaned under Russian serfdom and any Ukrainian who sought to retain his language and identity - like Taras Shevchenko - was sent to Siberia.....they should have known. Then, when Russian Bolsheviks invaded Ukraine and introduced terror and famine throughout the land .....they should have known. Let us hope and pray that this and future generations of Ukrainians will not be as naive and gullible as their forefathers have been. The cost in human suffering, exploitation, depredation, and humiliation is too great to bear.